A psychiatrist who has received international recognition for her research on the neural basis of primate social cognition, Leslie Brothers, M.D., offers here a major argument about the social dimension of the human brain, drawing on both her own work and a wealth of information from research laboratories, neurosurgical clinics, and psychiatric wards. Brothers offers the tale of Robinson Crusoe as a metaphor for neuroscience's classic (and flawed) notion of the brain: a starkly isolated figure, working, praying, writing alone. But the famous castaway of literature, she notes, came from society and returned to society. So too with our brains: they have evolved a specialized capacity for exchanging signals with other brains - they are designed to be social. This can be seen in the brain's sensitive attunement to the meanings of facial expressions and physical gestures and the way it assigns mental lives to physical bodies - a feat we too often take for granted. (Brothers describes fascinating case studies that show that certain kinds of brain damage can destroy a patient's ability to interpret faces, leaving him or her with the sense that they are surrounded by zombies.) She takes us down to the level of the individual neuron, exploring the response of brain cells to social events. 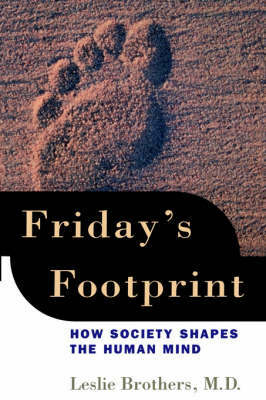 Perhaps most important, she connects neuroscience, psychiatry, and sociology as never before, showing how our daily interaction creates an organized social world - a network of brains that generates meaningful behavior and thought. Emotion, the sense of self - the entire spectrum of the mind - has no existence outside of a social context. Brothers conducts her argument with grace and style. By broadening our approach to the brain, this groundbreaking book makes an important contribution to our understanding of the human mind.